Synopsis : Information on choosing a reliable new electric mobility scooter that suits the purpose you need it for. For many people with limited mobility a powered scooter is a good alternative to a wheelchair. Many people prefer a scooter to a wheel chair as they are more attractive visually, are lighter, more compact and have better maneuverability. We will look at mobility scooter features, their value as mobility aids and other information to consider when choosing a mobility scooter. Mobility Scooters usually consist of a base unit, the drive chain, the seat, and tiller, as well as the batteries and wheels. The base unit is the chassis that the other components are attached to. This chassis provides the area where the feet go in between the tiller and the batteries or drive chain. The drive chain is the part that powers the scooter. The tiller is the handlebar that steers the mobility scooter. An electric mobility scooter is composed of a wheeled platform containing the drive unit and batteries, with controls and hand rests towards the front and a seat at the rear. For rugged terrains and hills a rear wheel drive unit would be preferred as they have better traction than a front wheel drive model. The platform or drive unit is usually made from steel, aluminum or fiberglass or sometimes a composite is used. There may be a cover over the drive head and dashboard instruments. When considering the scooter to purchase the size, ground clearance and turning radius should all be considered as these relate directly to the maneuverability. To ensure the needs of the rider are met the base unit dimensions and construction should be carefully considered. The feet must be comfortably accommodated and the controls easy to use and comfortably within reach. This is vitally important for a very tall or short riders. Many scooters have adjustable seats and arm rests and some have various base dimensions or extra footrests for longer legs or for those who wear leg braces. Stability of the base unit on inclines and sharp turns is important. Many scooters have anti-tip mechanisms on the wheels for stability during maneuvers of these kinds so we advise you to check that the scooter your are considering has these mechanisms. 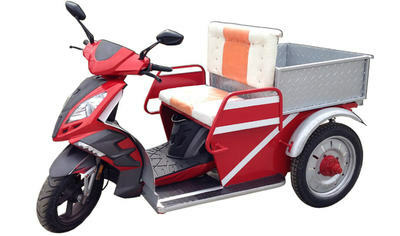 Modern red sporty scooter with side by side seat for two people and back carrying tray. Manufactured primarily for indoor use, front-wheel drive units are less powerful than rear wheel drive models but usually smaller and more maneuverable. They are only recommended for smooth floors or pavements and may have difficulty coping with curbs. Front wheel drive scooters also tend to be small/boot scooters rather than larger pavement or road legal scooters. Rear wheel drive mobility scooters use a chain, belt or transaxle mechanism to drive the rear wheels. With more powerful motors and longer range, rear wheel scooters are much better in rougher terrain or uneven pavements. They are larger than front wheel drive models and less maneuverable. Rear wheel drive scooters "push" the rider whereas front wheel drive scooters "pull" the rider. This offers more power and efficiency and so provides a better ride, and allows the scooter to go up steeper hills. More suited to outdoor use they have higher speeds but are less easily transported and less likely to fit into wheelchair lifts. Rear wheel drive models have an electronic braking system that is engaged when pressure is released from the controls. The brakes therefore will always be engaged when the unit is not being driven forwards or in reverse. In order to be able to move the scooter manually a brake release lever is provided. Many scooters have disc brakes in combination with, or instead of, the electronic system. Mobility scooters use electro magnetic regenerative brakes which work by slowing and then stopping the scooter as soon as the user releases the controls. When the brakes are applied, the batteries are recharged by the excess power from the motor. This type of brake means that a separate hand brake is not necessary, and that the scooter can be left on a slope without fear of it rolling away. In contrast front wheel drive models do not usually have an electronic system but have a parking brake that is manually applied to the rear wheel. The electric power system is either 12 or 24 volts supplied by one or two batteries. Rear wheel drive systems are generally 24 volts while the front wheel systems 12 volts. Add on units may be available to increase the range, but not the speed, of the scooter. The batteries are not interchangeable with auto batteries as their job is for sustained provision of power rather than a short starting burst as required by an auto battery. Their lifetime is between twelve and eighteen months and they are designed for regular charge and discharge. Batteries may be of the lead acid type or the gel cell type and are usually purchased as an extra. Battery chargers, whether integral or separate units are usually included in the purchase price. Ensure that the correct type of battery is purchased as chargers may be specific to the type of battery (lead acid or gel) although some chargers are dual purpose. Both independent and integral chargers have their advantages and disadvantages. An integral charger is convenient but if it goes wrong the whole scooter must be returned for repair. An independent charger is bulkier to move around but more easily replaced if needed. Maneuverability of the scooter depends to a large extent on the wheel and tire size. Small tires on front-wheel drive models increase maneuverability but decrease traction so rear wheel drive scooters generally have bigger tires for better grip on uneven terrain. Pneumatic tires, foam filled tires and solid tires are available. Pneumatic tires, as on most autos, are better for comfort but need maintenance and replacing when worn. Foam filled tires cannot be deflated and are almost maintenance free. However they are less comfortable to ride and more expensive. Solid tires are only suitable for indoor use, are maintenance free but considerably less comfortable. The seating should be considered carefully when choosing a mobility scooter. Arm and head rests may be included and seat padding will play a big factor in comfort especially when the scooter is ridden for a long time. Fabric covering is much more comfortable than vinyl but more expensive and harder to clean. Powered seats are a big help in mounting and dismounting but add to the cost. Powered seats may also allow elevation but again this feature will increase both the initial cost and the drain on the batteries. Seats that can be adjusted will be necessary if the rider is taller or shorter than average. Check to see if armrests can be flipped up for mounting. The tiller controls the direction, and speed of the mobility scooter, and is like a bicycle handle bar. The scooter moves by either pulling or pushing the lever on the tiller (called a wigwag). Some models of scooter have a Delta tiller meaning that the user can either pull with the fingers (like a bicycle brake) to make the scooter move, or push with the thumb. This tiller is ideal for people with limited hand mobility or who have one hand much better than the other. This means they can use the same hand for both moving forward and reversing. The control panel on the tiller includes the battery gauge, the speed control, and the horn and light controls, where fitted. Speed Controller: The scooters speed is usually controlled by a rotary control, which ranges from low speed to high speed. On some 6 and 8mph mobility scooters there is a switch that lowers the top speed from 6/8 mph to 4mph to make it pavement legal. Thumb levers are the most common types of controls but joysticks and loop handles are also used. A joystick attached to the armrest may be more suitable for someone with limited thumb mobility or strength. Other accessories that may be important to an individuals needs include oxygen transporters, crutch holders and front or rear baskets. Horns, lights and canopies are also optional in many cases. The decision of which electric scooter to buy can be daunting, however. Scooters are an investment that you can enjoy for many years, so taking the time to do your research ahead of time can save you frustration down the road. This guide will help you familiarize yourself with the questions to ask to ensure that you buy the mobility scooter that best suits your needs. If you are suffering from limited mobility, an electric mobility scooter is a ticket to freedom. An electric scooter will help you to live a more independent life, without having to rely on other people to navigate your own home or to enjoy the outdoors. Are you looking for an electric scooter primarily for indoor or for outdoor travel? Where you plan to use your scooter will have a major impact on your choice of which model to buy. If you are planning to use your scooter mostly inside your home, for example, a tight turning radius and easy maneuverability are going to be your most important concerns. A compact mobility scooter could be the right choice for you. If you are intending to travel outdoors, you will want to have a more solid scooter that can handle rough ground and uneven pavement gracefully. Stability and speed will be important considerations. A 4 wheel mobility scooter could be your best bet. Do you need to navigate curbs or steep hills? If you are planning to navigate difficult terrain such as steep hills or curbs, you will need an electric scooter with some extra power behind it. A 4 wheel mobility scooter often has the power and the stability to handle obstacles. Are you planning to drive on roads? If you would like to use your travel mobility scooter on roads instead of on pavement or grass, you should familiarize yourself with local laws. In most cases, medical scooters need to be able to travel at least 8 MPH to be used on roads, and must be equipped with both headlights and taillights. Will your home restrict the scooters you can use? If your home has a narrow gate or if you have many stairs leading up to your apartment, you will want to take these factors into consideration when buying an electric scooter. It won't be of much use to buy a travel mobility scooter that cannot fit through your front gate or your doors, for example. Will the medical scooter be comfortable for your body? Scooters can help people with a wide range of mobility restrictions achieve a higher level of independence. Therefore, it is important for you to determine which scooter is right for your body. For example, if you have difficulty sitting upright, stability is going to be a high priority for you. A 4 wheel mobility scooter is an excellent choice. Of course, comfort is also a top consideration when buying an electric mobility scooter. If you are tall, for example, a 3 wheel mobility scooter can better accommodate your long legs. For some people, getting on and off of a medical scooter might pose a challenge. A scooter that offers a swiveling seat for easy entrance and exit could be a real advantage for you. Will you need to transport your mobility scooter? If you are planning to take your electric scooter with you when you travel in a vehicle, you will have a different set of concerns than if you are planning to run most of your errands from your home. Unless you have a large vehicle that accommodates a full-sized scooter, a compact mobility scooter is a good choice for travel in automobiles. Compact mobility scooters are designed for convenient travel. Depending on the model you choose, these scooters can fold down to fit into the trunk of a car, or be assembled and disassembled without requiring tools. Many forms of public transportation, such as busses, trains, and subways, will also accommodate electric scooters. You should check with your local transportation authority for information about any size restrictions that you should bear in mind when traveling with your medical scooter. Is storage space an issue for your travel mobility scooter? A compact mobility scooter is also a good choice for people who have limited storage room in their home. These easily collapsible electric scooters can be stored in closets or in a convenient corner. It is also convenient if you have an electrical outlet in the area where you will want to store your scooter, so that it can be recharged when not in use. Can the electric scooter handle the accessories you want? Different models of medical scooter offer a range of accessories to go with them. From canopies to keep off the rain to storage for crutches or cargo, you have many options to consider. For example, if you are planning to use your scooter for shopping trips, you'll need to consider the question of where to store your cargo. The options for carrying items with your medical scooter vary widely, from baskets that attach to the handlebars to trailers that are pulled behind the scooter, and many options in between. An electric mobility scooter that can accommodate the accessories that you need to achieve your goals will be paramount to you. Do you need an electric scooter that can run all day? A lighter scooter has the advantage that it puts less of a drain on the battery. If you won't have time to recharge a scooter throughout the day, you might want to consider using a lighter model. Buying an electric mobility scooter is an important step towards freedom. By considering these ten important questions before you buy, you can ensure that your money is wisely spent. Will you buy your scooter online or offline? Although shopping for a medical scooter in an offline store is traditional, online shopping offers many advantages, especially for people who have trouble getting around. Online shopping for electrical scooters lets you compare prices, accessories, and options from the comfort of your own home. Many online mobility scooter stores offer free shipping directly to your door and an easy exchange or return policy if you are not satisfied with your scooter selection. Matching the needs of the rider with the features offered by the manufacturer is the most important consideration. Where will the scooter be used? Will thumb levers or a joystick be more suitable? Is the scooter the right dimensions and can it be adjusted for the size of the rider? Consideration to these questions will ensure that the mobility scooter chosen is the best one for the individual rider.